Sivantos has always been a leader in hearing innovation. Their customer-centered approach has led them to create both Siemens and Binax products. Sivantos newest line of hearing technology is Signia Primax, which strives to reduce listening fatigue and provide natural hearing. Primax delivers two firsts in hearing technology; better than normal hearing in difficult listening settings, and clinically-proven reduced listening effort. Signia Primax creates natural sound by combining individual preferences with the best in sound amplification. Signia Styletto: Stylish and Rechargeable! Styletto comes in a small, portable recharging case for easy handling and long wearing time. Patients enjoy a full-day of hearing aid use provided by our pin-shaped lithium-ion batteries. The intuitive Styletto charger offers, 19 hours daily use, 3 hour full charge, 30 minute fast charge and 3 full charges on the go. 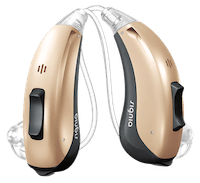 CROS Pure 312 is the first CROS accessory that supports direct streaming of music and phone calls to your hearing aid without the need for an intermediary device. It is also fully compatible with Signia’s myControl App for convenient remote control and more. Signia’s tiny Pure 10 sits nearly invisibly behind your ear and it can be remotely controlled via your smartphone. For all levels of hearing loss. Mild, moderate, severe or profound hearing loss, Pure 13 tackles all these challenges and gives you back the natural sound of life. The battery door of Signia’s Motion 13 can be equipped with a Telecoil. To activate the Telecoil, simply select the T-program wherever you see the Telecoil sign. Signia Primax is the first hearing aid to be clinically proven to reduce listening effort. An independent study measured EEG patterns in brain waves and found that Primax provided significantly easier listening in challenging environments. The study showed a reduction in listening effort and lower listening fatigue. Another study found that Primax hearing aids provided even better than normal hearing in difficult listening environments. 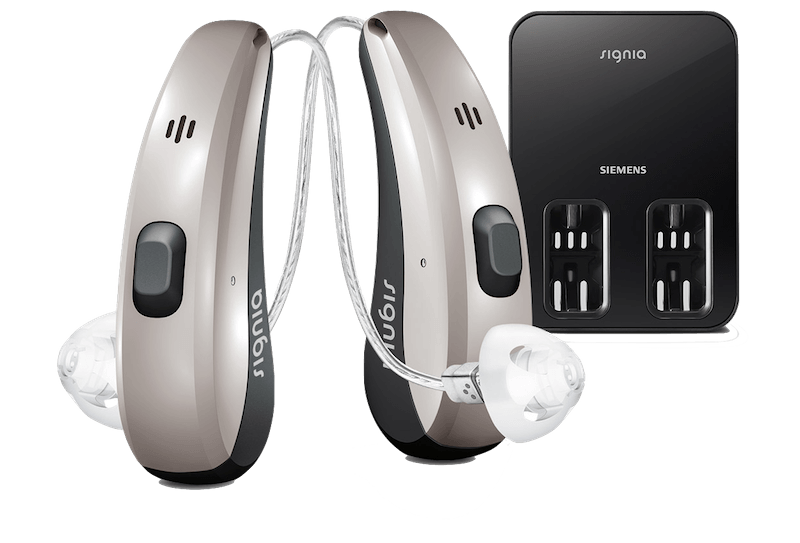 Signia Primax promises hearing made easy, thanks to a number of excellent features: SpeechMaster, EchoShield, HD Music, and TwinPhone. Delivering the best in noise reduction, SpeechMaster focuses the microphones on speech and reduces background sounds. This program runs algorithms that work hard to make sure you work less. It analyzes the sounds to focus on speech and reduce unwanted noise. SpeechMaster regulates listening directionality, noise reduction, and sound amplification to provide natural sound with minimal effort. This means you can focus on participating in the conversations around you rather than straining to understand the words. Primax has created a program for musicians and music lovers alike. HD Music uses 12kHz extended bandwidth technology to bring you a great musical experience every time. At the concert hall or at home, this program lets you hear music clearly. Three distinct music programs improve the quality of the music for performing music, attending a live concert, or listening to recorded music at home. Primax hearing aids feature a brand-new program, EchoShield, designed to reduce or eliminate uncomfortable reverberations and feedback to reduce listening effort. In large rooms such as churches, auditoriums or lecture halls, EchoShield analyzes soft sounds. It detects whether the soft sound is part of the target sound, or simply an echo. If the sound is an echo, EchoShield does not amplify this sound, and it does not distract you from the sound you are focused on. TwinPhone is a binaural listening program that aids in phone conversations. The Primax hearing aid closest to the phone processes the sounds and sends the signal to the other hearing aid. This means you hear the conversation simultaneously in both ears. TwinPhone is compatible with all phones because the phone is not streaming directly to the hearing aids using Bluetooth, but the hearing aids send signals back and forth. Primax promises to end the stress of struggling to hear voices. Primax comes in three performance levels to suit different degrees of hearing loss: 7px, 5px, and 3px. Signia Ace Primax is a small Receiver-In- Canal (RIC) model. For the best in Behind-The-Ear (BTE) design, look no further than Motion Primax, the best in comfort and convenience. Finally, Insio Primax is a very discreet custom made In-The-Ear (ITE) style that is almost undetectable. Additionally, Signia offers the Primax Platform in two specialty hearing aids: the Cellion Primax and the Silk Primax. With the Cellion Primax, Signia has made a significant upgrade to the way we hear. Cellion is a revolutionary, battery-free, receiver-in-canal hearing aid that uses lithium-ion technology. Reliable and quick, Cellion begins charging as soon as it is placed into the charging station and powers on automatically when it is removed from the power source. Built on the Primax platform, Cellion offers all of Signia’s advanced listening features, such as SpeechMaster, EchoShield, and HD Music. Currently, Cellion Primax provides wearers with one of the fastest charges and longest-lasting energy on the market. On a single overnight charge, Cellion Primax provides 24 hours of listening. For those on the run, a 30-minute charge provides seven hours of listening. If you’re out and about, Cellion Primax may be powered by a micro-USB travel charger. Unlike those with traditional hearing aids, Cellion Primax wearers no longer have to worry about changing batteries. With a OneShell design, the lithium-ion battery is built into the device and will last the lifetime of the hearing aid (about five years). If the power cell requires replacement, drop in to visit us at Atlanta Hearing Doctor. What if you could walk out of our office with immediate access to clear sound? With the new Signia Silk Primax, a ready-to-wear hearing aid, you could do just that. Built on the Primax platform, Silk boasts all of Signia’s advanced listening features, in an incredibly flexible and innovative device. Silk uses silicon Click Sleeves that “click” into the completely-in-canal hearing aids. Click Sleeves come in a variety of sizes, designed to fit most ear canals comfortably. Silk hearing aids are worn deep in the ear canal, where they provide excellent access to sound while remaining invisible. This level of discretion is preferred by wearers who lead active lifestyles or are new hearing aids. For first time users, Silk Primax offers a smart color design (red for the right ear, left for the blue) as well as instant access to sound. Unlike traditional hearing aids, which require a fitting process, wearers may wear Silk Primax hearing aids immediately. Silk’s OneMic design allows you to focus on the sounds you want to hear, while also reducing background noise for easier listening. Don’t wear yourself out straining to hear. Save your energy for what really matters, and find out more about the Signia Primax family today!